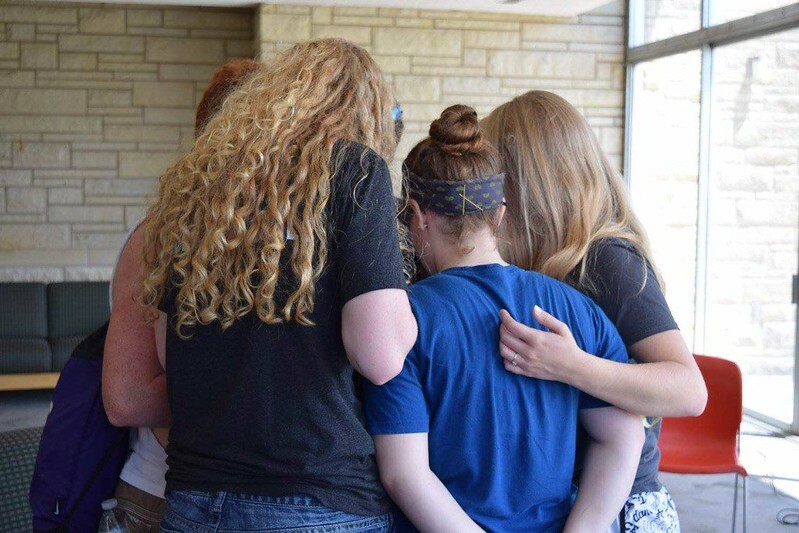 The first week of June, 23 high school students came together for the Amp It Up worship band camp on the campus of Southwestern College in Winfield, Kansas. The camp gives high schoolers a chance to learn from experienced musicians in their instrument or skill area – including Southwestern students and alumni of Worship Outreach bands and adult musicians who lead worship in area churches. These college and adult mentors helped lead band rehearsals, worship services and breakout sessions. Breakout sessions scattered throughout the camp were designed to give young people a taste and the basic understanding of a worship or technical skill. Topics included songwriting, worship planning, sound board and microphone management, song choice, vocal skill, music theory and transitioning from one song to another both technically and spiritually. While the breakout sessions covered technical skills, the focus throughout the rehearsals, lectures, and worship services was on teamwork, prayer, and interpersonal skills. “What I appreciate about Amp It Up is that it’s not just building musicianship skills. There’s a high emphasis on encouraging prayer – both individually and corporately within the bands – and about how you work together as a team,” Hanne said. “And that builds up the idea that worship music isn’t just about what I do or what you do – it’s about what we do together. It’s a mirror for who we are as a church. Camp director Martin Rude is very intentional about that focus on spirituality alongside and even above technical skill. “The one thing I want kids to get out of this camp is that Christ is pursuing them, Christ is with them and Christ is a music maker right along with them,” he said. “We’ve structured the camp so that not only does it have a strong emphasis on technical ability, but a paramount focus on spiritual formation, personal relationship, and how critical it is that the band works together as a small group – that they learn and grow and study together,” Rude said. Early in the week, the camp’s counselors and organizers prayed that the camp participants would grow together in a powerful way through their week. By the end of the camp, it was clear that their prayer had been realized -- the camp was filled with laughter, cheers and a strong sense of community. In fact, when asked where they saw God during the camp, many high schoolers said they found it in the sense of belonging and camaraderie that they felt at Amp It Up. “All of the other campers – they’re not strangers anymore. We have things in common, and they’re all here for the same reasons I am, and I feel like I’m home,” said one camper toward the end of the camp. For camp organizer Rude, helping young people grow in their faith as a part of a small group and learn how to work together in a ministry-related field is critical in helping them stay involved in ministry throughout their lives. “Equipping people in a ministry goes right back to the numbers and statistics that we’ve known -- that the majority of our pastors hear a call to ministry when they’re high school age or younger, but that many don’t pursue it until later in life because of a lack of nurturing and encouragement,” Rude said. “We want to give the encouragement, tools, development, and provide the experience of some success at that moment when the Holy Spirit is whispering into a young person’s life. Like Amp It Up on Facebook to see more photos, watch videos of jam sessions and worship services and hear about 2018 camp dates.